She is a fabulous looking yacht, with clean and clear lines, that combines the performances of a maxi racing yacht with the highest standards of comforts. She has undergone a complete refit in 2005 including new deck, complete exterior and interior repainting, new sails, new riggings, new equipments. On the spacious cockpit you can get a delicious Italian meal or relax on the large sun deck. On Speedy Go you will experience a spacious an elegant saloon, with two separate seating areas, perfect for relaxing with the modern entertainment centre. The guests accommodations are the large sized forward cabin with double bed plus a single bed that hides a comfortable bathtub, with separate double bathroom. Immediately backward the main cabins, there are two guest staterooms with double bed plus a single bed and separate bathroom. Towards the back of the saloon there is the fourth guest stateroom with double bed. Nicola is a hands on sailor who logged more than 100,000 sea miles in his 30 years of sailing career. Nicola's love of the sea has its roots in the Mediterranean Sea, where he was raised. He started as a youngsters, crewing and racing on many different boats. He can repair anything, from carpets to electronics. 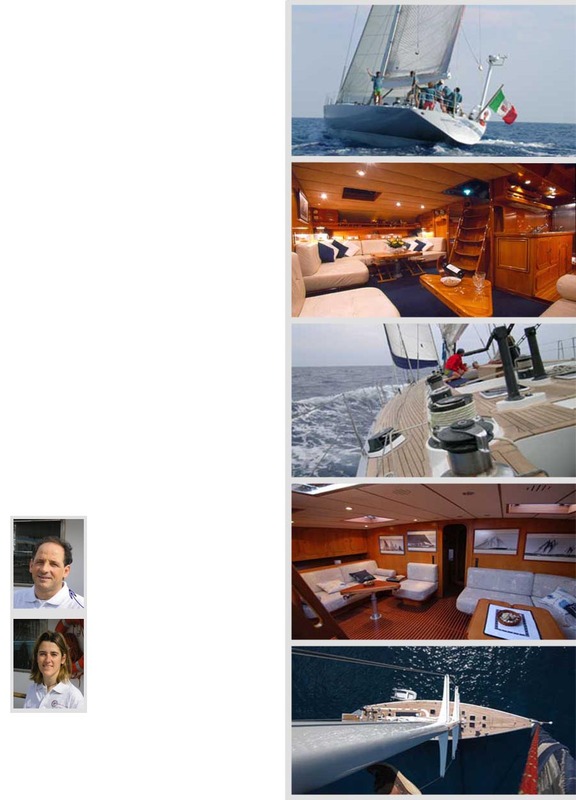 His professionality will esure the most enjoyable experience aboard his superb vessel. Nicola uses the experience and skill aquired as a captain on his fine vessel to achieve the hihest standards. Elena graduated in Maths at the University of Padua in 1997. Always in love with the sea, her italian cooking experience will gratify the guests with a varied and extensive menu. Cordon bleu and home made pastas, colourful entrées and super fish, her dishes can suit almos any dietary preference.